Medalink Uno machine is fun for the whole family and all ages. Challenge each other in this popular card game now in virtual mode for even easier and more exciting game play. 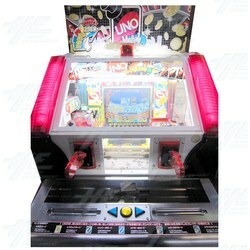 Purchase the other 3 machines in this collection to create a network of fun, all machines have particular game play and skills meeting the needs of all game players. Also, use this network for online generation play for additional excitement.